Exulting in joy for the light given to us this day, we offer praise and thanks to God, begging his mercy that, to us who solemnly celebrate the day of the Lord's Resurrection, He may deign to grant peace, tranquility and joy, that from the morning vigil even to the night, protected by the favour of His mercy, exulting in perpetual gladness we may rejoice. St. Goban, or Gobban, of Airdne Dairinse. In the Martyrology of Tallagh, this name is set down as, Goban Airdni Dairinsi, at this date. The Bollandists, quoting from the same authority, have Gobanus de Ara-Dar-Inis, at the 30th of May. This saint is said to have had another festival, at the 26th of March, when a notice of St. Gobban may be seen. Colgan also infers, that he must have been very distinguished for his piety and mental endowments, since he had a double festival instituted in his honour. Whatever can be known regarding him seems more or less involved in obscurity. However, attempts have been made, to clear away the mist, which has so long covered this saint's Acts. It is not known, whether he governed the Island of Molana, in the River Blackwater of Munster, and in the county of Waterford, or whether he ruled over an Island, in the present Wexford Harbour. Both places formerly went by the name of Darinis. Some writers say, this saint was abbot of Airdne, one of the Aran Isles, off the coast of Galway, and in several Martyrologies, we are told, he is styled Abbas Ardnensis. The common name of the three Islands was Ara, which in the nominative is Airne, or Arann in the genitive, according to the Irish. Wherefore, Father John Colgan thought Airne to have been a distinct name for one of these Islands. It is another mistake of his to write, that Ard-Olen was the same as that Island; for, Ard-Olen lies, as elsewhere he has properly stated, in another place. Neither is the most eastern the chiefest of the three Isles of Aran, as he took it to be, but rather it is the smallest. It is probable, that he was led into the mistake, by some incorrect map, in which these Islands were either misplaced, or their position was reversed. Before Colgan's time, the Maps of Ireland were grossly inaccurate. In some of them this East Island of Aran is set down as the largest. In others, the greatest size is claimed for the Middle Island. There are many places, in Ireland, called Airdne by our ancient writers; and, in modern phraseology, that denomination has been rendered into Urney or Nurney. One of those places, called Nurney, gives name to a townland and parish, in the present Barony of West Offaly, county of Kildare; and here, there are some ruins of an old church in a cemetery. In the same county, there is another parish of Nurney, in the Barony of Carbury. There is a parish called Nurney, likewise, in the Baronies of Carlow, Forth, and Idrone West, county of Carlow. However, it is not certain, that St. Goban or Gobban had connexion with any of these places. We find entered, likewise, in the Martyrology of Donegal, that Gobban, abbot of Airdne, was venerated, on this day. The Martyrology of Tallagh enters the name, Eoghan, Sapiens, at the 28th of May. The Bollandists also have Eugenius Sapiens, at this same date, and on the same authority. We are ignorant regarding his period and locality. Veneration was given on this day to Eoghan, the Sage, as we read, likewise, in the Martyrology of Donegal. At this date, the Martyrology of Tallagh records the name of this holy virgin, under the designation Commaigh, daughter of Eachdach, of Snamha luthair. The Bollandists have also a like entry, at the 27th of May, for Comagia of Snam-Luthir. It appears, that this holy virgin was daughter of Eochaidh, her father, and Aigleann or Ailgend, her mother. She was fifth in descent, by the father's side, from Laeghaire, monarch of Ireland, in the time of St. Patrick. Her father was son to Ailill, son of Guaire, son to Lughaidh, son of King Laeghaire. Her brothers were St. Fintan, St. Lughaidh, and St. Coluin. Besides these uterine brothers, her father had been married to Ligach Bredmainech, by whom he had St. Fursey, St. Nainnidh, and St. Muiredach. The monastery at Snam-luthir had been founded, by the brother of St. Comaigh, a holy man named Columbanus, or Golman. It was supposed, by Colgan, that Snam-Luthir had been identical with a monastery, founded at Garbre Gabhra, otherwise Carbre Mor, in the maritime part of northern Connaught, and by a certain Columbanus, a holy man, who was son to Echad. In like manner, the Rev. Mervyn Archdall and Rev. Dr. Lanigan say, that Snam luthir was a monastery, in the present barony of Carbury, and county of Sligo. Another name for this territory is said to have been Carbremhor or Carbre Droma-Cliabh. This opinion has been most generally received. However, that place has been identified, by other writers—and notably by Rev. Dr. Reeves —with Snawlooher, or Slanore, a townland in the parish of Kilmore, barony of Upper Loughtee, and county of Cavan. Not a vestige of the old monastery now remains. There, however, various remains of mortality have been discovered, and it would seem the ancient religious foundation stood, also, some where about the beginning of the seventh century. 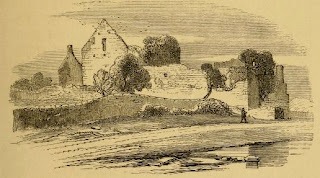 St. Coluin, the brother of our saint, appears also to have lived—at least for a time—in this place... An abbey's site is shown in a field, which is called the Abbey-field, in the western part of Snawlooher or Slanore townland. This contains about 130 acres, and it is situated a little south from Lough Oughter, on the west side of Kilmore parish. It appears, furthermore, that Cairbre Gabhra is now represented, by the modern barony of Granard, in the northeastern part of Longford County; while, this territory must have proceeded still farther towards the north, so as to include a considerable portion of Upper Loughtee, in the county of Cavan, since Snamh-luthir, Snawlougher, or Slanore, was within it. Veneration was given on this day, to Comaigh, Virgin, of Snamh Luthair, as we find entered, in the Martyrology of Donegal. St. Mocholla, Daughter of Diomma. The Martyrology of Tallagh thus records this name, at the 25th of May, as Mocholla inghen Diomo. However, quoting the same authority, the Bollandists, at this date, enter Mocholla, filia Damae. According to the Martyrology of Donegal, Mocholla, daughter of Diomma, was venerated on this day. St. Ultan, Son of Aedhghen. The Martyrology of Donegal, mentions a festival, on this day, in honour of Ultan, son of Aedhghen. St. Nechtlaice, or Nechtlic, Bishop. The name Nechtliacc, Bishop, is venerated, in the Martyrology of Tallagh, at the 23rd of May. The Bollandists, in like manner, commemorated Nechtlagius Episcopus, at the same date; but, we find no means of knowing when he flourished, or where he presided over any See. It is entered, likewise, in the Martyrology of Donegal, that Nechtlic, Bishop, had a festival on this day. May 20 is the commemoration of a County Donegal saint, Conall (Connell, Conald) of Iniscaoil. I introduced this saint here at which time I mentioned that a second saint with a similar name is commemorated on May 22. There is a post on the second Saint Conall here. There may well be some confusion regarding the date of the feastday, although the 17th-century hagiologist, Father John Colgan, believed he was dealing with two distinct individuals. Saint Conall was said to have enjoyed the friendship of the poet saint Dallan Forgaill, best known for his hymn in praise of Saint Columcille, both were members of the Columban family. In the paper 'Iniskeel' below, abridged from the Irish Ecclesiastical Record, the author writes of Saint Conall's island home and of the Turas or stations performed in his honour. Unlike some other writers of the period, he is at pains to defend these traditional practices from the charge of superstition, and as a Catholic writer he is naturally delighted by the traditions linking this Donegal saint with Rome. In his presentation of a romantic view of the island home of Saint Conall, the writer is very much in tune with the spirit of his age. The imagery of remote, windswept landscapes where the mind could not help but turn to God played, and indeed still plays, an important role in the portrayal of the 'Celtic Church' and its saints. OFF the coast of Western Donegal, in the district anciently known as Tir-Ainmirech, but called Boylagh, since the thirteenth century, lies the holy island of Connell Coel....The island has a sacred interest in the present and the past with a long, if broken, history to commemorate its former greatness. It is still the seat of a much frequented pilgrimage in honour of St. Connell, one of the most remarkable of Ireland's early saints. It contains his church and cell; and in it repose his sacred remains in the grave that had first closed over the body of his illustrious friend, St. Dallan. The "station" may be performed at any time. But the solemn season lasts from the 20th of May, St. Connell's day, to the 12th of September. Besides the founder's well, there is another sacred to the Blessed Virgin. Fixed prayers are devoutly said at each, as also in going round the penitential piles, of which there are several, formed as a rule of small sea-stones which are kept together by the self-mortifying attention of the pilgrims. A number of decades repeated in walking round the old ruins and before the altar of St. Connell's Church bring the Turas to a close. The devotion and faith of the crowds who throng to Inniskeel during the Station season recall the memory of the first believers in Christianity. They possess the genuine spirit of Gospel Christians, and it would be strange indeed looking to the beneficence of God's providence towards simple, faithful souls, if prayers offered up with such fervour and commended by such powerful patronage, did not bring down, on those devout pilgrims the choicest blessings of heaven. They speak to their Saviour in earnest communion of heart, believing firmly that He is the physician of physicians for soul and body. Is it then unreasonable to think that for these meek confiding ones Christ in view of Connell's merits allotted curative properties to the saint's well? Their faith, their prayers, and the blessing of heaven on the spot do indeed work wonders. Nor need going round the piles a fixed number of times, raising at intervals the position of some low-placed pebble, or moving larger stones round the head and waist, force up the idea of superstitious observance. If St. Connell or any one of his saintly followers wished to found a penitential and supplicatory course of exercises, what more proper than that their ritual should be minutely fixed and accurately handed down? Now this is the feeling that sways these crowds of pilgrims from age to age. Their faith is simple and their hope unbounded. Flourish such faith and hope! They give as just a notion of God's warm providence as the acutest reasoning of philosophy. There seems to be no ground for questioning the popular belief that St. Connell founded the buildings which still remain. At the same time substantial parts were certainly rebuilt at a later period. Both church and cell are situated on a beautiful slope of the south-eastern side of the island. The orientation of the church seems perfect. The other edifice which stands a few paces further east points in the same direction. The ground plan of both buildings is rectangular, the former measuring fifty feet by twenty, the latter something less in breadth, but almost the same in length. The church retains its gables, windows, and doors, in an state of fair preservation; but one of its sidewalls is almost completely broken down for some yards. The altar table, of substantial flags, has retained its hold with magnificent tenacity. The cell or monastery is in a still more ruined condition. Apparently it was never so high as the church, and at present gables, from a little above the square, serve but to block the doors and narrow windows or fill in gaps in the lower masonry of its walls. Neither building can lay claim to exceptional beauty of architecture, but they are fairly large in size, neatly and well built, and above all charmingly placed in situation. On this delightful ground with the waves expiring gently at his feet or rolling in fury on "the Ridge" beyond, St. Connell raised each morning his pensive soul from thoughts of nature's beauteous handiwork to contemplate the great, Creator by whose almighty word it had all been fashioned before time for man began. A glance northwards enhanced the view. It should have swept over kingly Errigal, and rest on Aranmore or the chainless waves of the sky-meeting ocean. What a home for meditation this peaceful isle with such giant surroundings by land and sea! Assuredly no island recluse can be an atheist, can fail of being an intense believer. With the impress of divine intelligence above him and around him, with a voice in the heaving billows or rushing sea-wind, if he have ethical uprightness of intellect and will to grasp the significance of the scene, no man could escape the all-pervading sense of God's presence, no man could here live the life of a hopeforsaken infidel. Neither the din of cities, nor social strife, nor crowded brick and mortar intervene to shut out reason's strong lesson or the light of divine faith. The island saint is a true philosopher; he must be religious to the core. Such was Connell, founder of Inniskeel, and such was Dallan its frequent visitant. Colgan has left us several particulars of the latter saint. His notes on St. Connell are only incidental. The Christian name of Inniskeel's patron is variously spelled in Irish as in English, the form Conald being supported by some ancient authorities, whilst Conall, Connall or Connell approaches much nearer the pronunciation (Cuinell) common in Boylagh. In like manner his second name is written Caol, Caoil, Cael, Coel or Ceol. Mac Cole is still a family name on the mainland. The local Irish pronunciation, however, sounds like Caol (slender), and hence some have thought the island derived its name from the needle-like appearance it presents from certain points of view along the coast. But more probably it came from Connell's father, for to distinguish the saint from a famous Umorian chief, who bore his double appellation, he is described by our annalists as the son of Ceolman. Thus in Latin he is said to be filius Ceolmani or filius Manii Coelii. If he be expected to expire before morning." The Cain Domnaigh was never enacted by the states or Councils of Erin. That it was believed to have been brought from Rome sufficed to spread its sway. It is now time to say something of St. Connell's famous friend Dallan Forgail. Euchodius is the Latin form given by Colgan for his original name. The better known appellation of Dallan is obviously derived from dall, blind; for at an early stage in his career he lost the use of his eyes. Notwithstanding this dismal fate he became the most eminent man of letters in Ireland, at a time when the paths of scholarship were eagerly pursued by a host of able men. He was antiquary, philosopher, rhetorician, and poet all in one. He was the literary chief, the file laureate of Erin in his day. A saint's life and a martyr's death crown the glory of his fame. He was born, as Colgan tells us, in Teallaeh Eatbach, which we take to be Tullyhaw in Cavan. Removed by only a few degrees of descent from Colla, King of Ireland, St. Maidoc, of the same lineage, was his cousin. From his mother, Forchella, he received the second name, Forgail, which we sometimes find added in the old writers. Nothing that parental care could accomplish was left undone to perfect his education in sacred and secular subjects. From an early date he took to the antiquarian lore of his country as a special study. It was in this department, so indispensable for an Irish scholar of the sixth century, that he first attained an eminent place. Not unlikely his research into ancient records had something to do with the difficulty of the style in which he wrote. It appeared archaic even to experts who lived centuries before Colgan wrote; and we are told by this author how in the schools of Irish antiquities it was usual to expound Dallan's compositions by adding long commentaries on these rare specimens of the old Celtic tongue. The Amhra Coluim Cille or written panegyric on Columbkille was his best known work. When the famous assembly at Drumceat was breaking up, just after Columba had succeeded in directing its proceedings to such happy issue, Dallan came forward and presented the saint with a poem written in eulogy of his merits. A part of the composition was thereupon recited ; but only a part. For, as the event is told by Colgan, a slight feeling of vain-glory brought the demons in whirling crowds above Columba's head, before the astonished gaze of St. Baithen, his disciple and attendant. No sooner did the person principally concerned in this wonderful occurrence perceive the terrible sign than he was struck with deep compunction, and immediately stopped the recital. No entreaty ever after could induce him to allow the publication of the panegyric during his life. But by unceasing effort Dallan obtained the saint's permission to write a eulogy of him in case of survivorship. An angel, we are told, brought the news of Columba's death to St. Dallan, who forthwith composed his famous Amhra Coluim Cille, embodying in all probability, much of his former panegyric. As soon as the learned work was completed Dallan recovered his sight, and received a promise that anyone who would piously recite the composition from memory should obtain a happy death. This promise was liable to abuse in two opposite ways. The wicked might be tempted to look upon the recital of the eulogy as an easy substitute for a good life. The good, from seeing this interpretation carried into practice, might naturally be inclined to turn away in disgust from all use of the privilege. In point of fact both these errors began to show themselves, and were sure to grow, did not a miraculous event occur to put the promise on a proper basis. A cleric of abandoned life took to committing the rule as a more comfortable way to heaven than the path of penance. But, after learning one half, no effort would avail for further progress. So, as he still wanted to put off, or rather get rid of the day of reckoning, he made a vow, and in fulfilment of it went to Columba's tomb, whereat he spent a whole night in fast and vigil. When morning dawned his prayer had been heard. He could recite the second part of the poem word for word. But to his utter confusion not a trace of the lines he had known so well before remained on his memory. What happened him in the end we are not told. Let us hope he applied the obvious lesson his story preaches. As Colgan says, it not merely showed that a true conversion of heart must accompany the pious repetition from memory of Columba's praises, if eternal life is to be the reward. In this particular instance the value of the promise was clearly conveyed. The person's perverse intention was visibly punished by his being afflicted with inability to fulfil an indispensable condition of the privilege. He could not even commit the words. St. Dallan composed another funeral oration in praise of St. Senan, Bishop of Iniscattery. It was prized both for its richness of ancient diction, and for the valuable property of preserving from blindness those who recited it with devotion. He composed a third Panegyric on St. Connell Coel for whom he entertained a most enthusiastic esteem. Colgan, who says he possessed copies of the two former compositions, states that he knew not whether that on the Abbot of Inniskeel was then extant. All three, unfortunately, are now gone. Dallan had often besought in prayer that he and St. Connell might share the same grave. The favour came to be enjoyed in a manner at once saintly and tragic. He had been a frequent visitor at the island monastery, and the last time he came, a band of pirates landing from the neighbouring port, burst into the sacred building, as he was betaking himself, after the spiritual exercises, to the repose of the guest-room. These fierce sea-rovers, who in all probability were pagans, from more northern coasts, plundered ruthlessly on all sides, and brought their deeds of sacrilege to a close by cutting off the old man's head and casting it into the ocean. The abbot, who contrived to escape, on hearing that his dear friend had fallen a victim to the murderers, rushed to the spot where ho had been slain, but only to find the headless trunk of what had been St. Dallan's body. With tears and prayers he at once appealed to God, beseeching Him to reveal where the head of his martyred friend had been cast. The petition of one so favoured of heaven was granted. He saw it rise and fall on the waves at a distance and then move to the shore. He took it up with reverent care and placed it in its proper place on the body, when, lo! to his grateful delight, he found the parts adhere as firmly as if the pirate's cutlass had never severed them. St. Dallan's remains were then buried under the church walls with all the honour such earnest and mutual esteem was sure to prompt. This occurred about the year 594. Before the century closed St. Connell's body was laid in the same grave. Thus was St. Dallan's life-long wish gratified at last. No wonder the spot should be, in Colgan's words, the scene of daily miracles. St. Dallan's Feast occurs on the 29th January. His memory survived in the veneration of several other churches throughout Ulster. A very remarkable relic of St. Connell remained in the neighbourhood of Ardara until 1844. It was the saint's bell, called Bearnan Chonaill. It was purchased in 1835 by Major Nesbitt of Woodhill, for £6, from Connell O'Breslen of Glengesh, whom O'Donovan calls the senior of his name. The O'Breslens, who had been erenaghs of Inniskeel, claimed St. Connell as of their family, and hence the inheritance. Since 1844 when Major Nesbitt died, it has entirely disappeared and fears are entertained that in the succession of owners it may have been destroyed beyond hope of repair. Fortunately it had been previously seen and described by eminent antiquarians. We cannot convey a better idea of its appearance than by transcribing the following paragraph from Cardinal Moran's Monasticon Hibernicum. It is almost an exact transcript from one of O' Donovan's Letters. "O'Donovan says it was enclosed in a kind of frame or case which had never been opened. Engraved on it with great artistic skill was the crucifixion, the two Marys, St. John, and another figure, and over it in silver were two other figures of the Archangel Michael, one on each side of our Lord, who was represented in the act of rising from the tomb. There is a long inscription in Gothic or black letters, all of which are effaced by constant polishing, except the words Mahon O'Meehan, the name, probably, of the engraver. There are two large precious stones inserted, one on each side of the crucifixion, and a brass chain suspended from one side of the bell." Raised around the head of Failbe Flann Fidhbhadh." ...The island of St. Connell lies at present outside the parish of Inniskeel. Half a century ago itself and the adjoining districts were ceded to Ardara in exchange for certain townlands lying near Glenties. So the people of both parishes look to it with equal pride, and visit it with equal reverence. We feel sure that the lesson its great saint teaches as well as the benediction they obtain, will stand the children of Boylagh in good stead as the ages roll on. This said, we have completed a little vacation tribute of homage and gratitude, long since intended, to St. Connell and St. Dallan. Irish Ecclesiastical Record, Vol. 8 (1887), 781-794.
vi. (12) Brig, daughter of Findlug, his sister, was with him there, and great was his love for her, for he saw the attendance of angels above her. C. Plummer, ed. and trans., Life of Brendan of Clonfert, Bethada Náem nÉrenn – Lives of Irish Saints, Vol. II (Oxford, 1922), 46.
by the Very Rev. J. Fahey, D.D., V.G., P.P. Our antiquarians are no doubt familiar with the series of graphic sketches, in which the gifted Sir William Wilde has illustrated with pen and pencil the islands and shores of the Corrib. To say that these sketches are worthy of their distinguished author is no small measure of praise. I may perhaps add that his chapter on Annaghdown, is one of the most interesting and valuable of the series. He tells us how the little headland which extends there into the waters of the Corrib derived its designation from its local characteristics, the "dun" or fort which existed there, and the Eanach or marsh with which it is surrounded. He tells us how St. Brendan and his Sister St. Briga, the Benedict and Scholastica of Ireland, came to reside there; and invested the place for a period at least, with the attractiveness of another Subiaco. His pencil gives us with the strictest fidelity, the Cathedral, the Episcopal residence, and the old monasteries, all hoary ruins. And the massive Norman Keep, he has also sketched, which lifts its battlements high above the Wells of St. Brendan and St. Cormack, and speaks to us of a feudalism long past which has no where in Ireland a larger number of monuments than on the plains of Moy Soela. But the subject of my paper does not permit me to do more than make a passing reference to many of those objects of historical interest, grouped together on the little promontory of Annaghdown. My paper recalls the existence of a Diocese to which this headland has given its name; a Diocese which has ceased to exist for so long a period as to be now practically forgotten. We shall see that the period of its independent existence was connected with a troubled time in the history of our country, and reflects for us in a peculiar light, many of the strange events of that period. And though its brief period of independence secured for it a remarkable prominence, and a notoriety not always enviable, it is a curious fact that the exact dates of its foundation and suppression, seem to remain to our time enveloped in obscurity. There is no doubt that long before a Bishop had fixed his See at Annaghdown, the place itself was invested with a special religious and historical interest. It was one of those Sanctuaries which gemmed the islands and shores of the Corrib, in the sixth and seventh centuries, when the "holy foreigner" lived alone at Inchigall; when St. Fechin and his monks laid the foundations of their historic monastery at Cong, when religion in its most austere form, attracted to Inchiquin, and Kilursa, many members of the royal houses both of Connaught and of Munster. It was then that St. Brendan one of the most remarkable of our early Saints, selected the little promontory of Enaghdun, to be for a brief period his chosen place of prayer and repose. His marvellous labours which won for him the well merited title of "Pater laboriosus, " were nearly accomplished. His memorable voyages supplied his contemporaries with themes more wonderful than were furnished by the energy of Columbus to the people of his age. On the neighbouring island of Inchiquin, he had founded a monastery which he had placed under the wise guidance of St. Meldan, and there he had the happiness of blessing the marvellous child St. Fursey, whose future greatness he forecast with prophetic accuracy. His great Church and Monastery at Clonfert, he had completed and placed under the charge of his friend and companion St. Moennean. And here at Enaghdun he had built a monastery for his holy Sister Briga and her nuns, whose privilege it should be to witness his last moments, and close his eyes in the last blissful sleep. His death at Annaghdown, A.D., 577, at the venerable age of 94, was regarded by his contemporaries as an event of national importance. The funeral procession from Annaghdown to Clonfert was made up of a vast multitude from every part of Ireland, and was the most imposing demonstration of reverential regard for holiness of life which the century had witnessed. Rev. J. Fahey, ‘Diocese of Annaghdown’ in Journal of the Galway Archaeological and Historical Society, Volume III, (1903-4), No. II, 102-113. Below is a sermon of Saint Columbanus in which this great Irish Church Father teaches on God as Trinity. The text is taken from the electronic version of the works of Saint Columbanus edited by G. Walker and the original, including references to the Scriptural and other passages quoted in the sermon, is available here. Let each man then who wishes to be saved believe first in God the first and last, one and three, one in substance, three in character; one in power, three in person; one in nature, three in name; one in Godhead, Who is Father and Son and Holy Spirit, one God, wholly invisible, inconceivable, unspeakable, Whose property it is ever to exist since God the Trinity is eternal, for Whom you must not seek a beginning, Who has no end, and Who has ever been that which He is and shall be; since in God there is no repetition, but ever the perfection of the Trinity. That God the Trinity is one, God Himself bears witness of Himself in the law, saying Hear, Israel, the Lord thy God is one. But that that one God is a Trinity, the Saviour taught in the gospel with the words, Go now and teach all nations, baptizing them in the name of the Father and of the Son and of the Holy Ghost. By this double evidence of the two laws, as on some firmest supports, the faith of believers is confirmed. And there you truly have a unity in Trinity and Trinity in unity. Briefly then, considering the greatness of the matter, we have spoken of what we believe, and the heart's faith [has drawn forth] the confession of the mouth; and this must be firmly held against all heresies, that the one God cannot be divided or parted, since that which is all, has always been as it is. Thus let there be an end to the poisonous and mad delirium of all the heretics, because we hear and believe on the witness of God Himself, Hear, Israel, the Lord thy God is one, since He Who is one, has ever been exactly what He is; but that you may know how many, He spoke in the plural number at the foundation of the world, Let us make man in our image and likeness. Yet lest you should err upon the number, Christ shows you the Father and the Son and the Holy Ghost, and in the name of this God as one God the whole human race is to be baptized. What more is needed on the joint eternity of the Trinity? That God is one, teaches us enough. But on the reality of the persons of Father and Son and Holy Ghost, Christ's division, with the authority of a command, has fully informed the hearers. So all the pravity of errors is debarred by means of these evidences, in which the Trinity is proved by being named, and the unity by being witnessed. Since then the greatness of the matter prevents us from discoursing further on subjects which appear to be unspeakable, let us hold what has been said before with a firm faith. For the man to whom these few words on God the Trinity are not sufficient, will not, [according to Scripture,] be profited by more. For of Him we have said only that He is one in three and three in one. Yet of His being who shall be able to speak? Of how He is everywhere present and invisible, or of how He fills heaven and earth and every creature, according to that saying, Do not I fill heaven and earth? saith the Lord, and elsewhere, The Spirit of God, [according to the prophet,] has filled the round earth, and again, Heaven is my throne, but earth is the footstool of my feet? Therefore God is everywhere, utterly vast, and everywhere nigh at hand, according to His own witness of Himself; I am, [He says,] a God at hand and not a God afar off. Therefore it is no God dwelling far off from us that we seek, Whom if we merit it we have within us. For He resides in us like soul in body, if only we are sound members of Him, if we are not dead in sins, if we are uninfected by the taint of a corrupt will; then truly does He reside in us Who said, And I will reside in them and walk in their midst. Yet if we are worthy that He should be in us, then in truth we are quickened by Him as His living members; for in Him, [as the Apostle says,] we live and move and have our being. Who, I say, shall explore His highest summit to the measure of this unutterable and inconceivable being? Who shall examine the secret depths of God? Who shall dare to treat of the eternal source of the universe? Who shall boast of knowing the infinite God, Who fills all and surrounds all, Who enters into all and passes beyond all, Who occupies all and escapes all? Whom none has ever seen as He is. Therefore let no man venture to seek out the unsearchable things of God, the nature, mode and cause of His existence. These are unspeakable, undiscoverable, unsearchable; only believe in simplicity and yet with firmness, that God is and shall be even as He has been, since God is immutable. Who then is God? He is Father, Son and Holy Spirit, one God. Seek no farther concerning God; for those who wish to know the great deep must first review the natural world. For knowledge of the Trinity is properly likened to the depths of the sea, according to that saying of the Sage, And the great deep, who shall find it out? If then a man wishes to know the deepest ocean of divine understanding, let him first if he is able scan that visible sea, and the less he finds himself to understand of those creatures which lurk beneath the waves, the more let him realize that he can know less of the depths of its Creator; and as he ought and should, let him venture to treat less of Creator than of creature, since none can be competent in the greater if he has not first explored the less, and when a man is not trusted in the lesser, in the greater how should he be trusted? For why, I ask, does a man ignorant of earthly things examine the heavenly? Oh, those who speak idle words, Not knowing, [according to the Apostle,] either what they speak or whereof they affirm! How many indeed, for whom the cry is woe, though striving to fly aloft with feeble wing, and turning their creaturely face towards the sky, at least partly, not to say in every case, without counting the cost beforehand, first venture with unclean heart and impure lips to teach concerning the great deep, not understanding that God the Trinity is known not by words but by faith, Who is understood by the pious faith of a clean heart, and not by the gabble of an impious mouth. Therefore the great Trinity is to be piously believed and not impiously questioned; for the one God, the Trinity, is an ocean that cannot be crossed over or searched out. High is the heaven, broad the earth, deep the sea and long the ages; but higher and broader and deeper and longer is the knowledge of Him Who is not diminished by nature, Who created it of nought. Understand the creation, if you wish to know the Creator; if you will not know the former either, be silent concerning the Creator, but believe in the Creator. For a silent piety is better and knows more than an impious garrulity; for it is unseemly and impious enough to pass over from faith to the empty words of one who treats of the invisible, immeasurable, and unfathomable Lord. For The great deep, [as it is written,] who shall find it out? Since, just as the depth of the sea is invisible to human sight, even so the Godhead of the Trinity is found to be unknowable by human senses. And thus if, I say, a man wishes to know what he ought to believe, let him not think that he understands [better] by speech than by believing; for knowledge of the Godhead will recede farther when he seeks it than it was. Therefore seek the supreme wisdom, not by verbal debate, but by the perfection of a good life, not with the tongue but with the faith which issues from singleness of heart, not with that which is gathered from the guess of a learned irreligion. If then you seek the unutterable by discussion, He will fly farther from you than He was;if you seek by faith, wisdom shall stand in her accustomed station at the gate, and where she dwells she shall at least in part be seen. But then is she also truly in some measure attained, when the invisible is believed in a manner that passes understanding; for God must be believed invisible as He is, though He be partly seen by the pure heart. Wherefore, my dearest brethren, let us pray to our God Himself, everywhere present and invisible, that either faith's fear of Him, or charity which knows no fall, may endure in us; and may this fear joined to charity make us wise in all things, and may piety persuade us to be silent on what is too great for speech, since it is a thing unsearchable and ineffable to know God as He is. Who He is and how great He is, He only knows. But since He is our God, though invisible to us, He must yet be besought by us, often besought; ever must we cling to God, to the deep, vast, hidden, lofty, and almighty God; and we must pray by the merits and intercession of His saints, that He would bestow even some ray of His light upon our darkness, which may shine on us in our dullness and ignorance on the dark roadway of this world, and that He would lead us to Himself, by the favour of our Lord Jesus Christ, to Whom with the Father and the Holy Spirit is the glory unto ages of ages. May 10 is the feast of Saint Comgall, founder of the monastery of Bangor. Canon O'Hanlon has helpfully recounted many of the miracles attributed to him recorded by the Bollandists. Some give an interesting glimpse into the monastic life and the virtues of humility, obedience and penance which Saint Comgall taught. Here is a selection, the headings are mine, the text O'Hanlons. When Comgall had a great number of monks, subject to his rule, an Abbot, who was his senior, and under whose roof our saint had dwelt for some time, came to his monastery. When they sat down to table, and rejoiced in the society of each other, in order to test Comgall's humility, and to find if his former spirit of obedience yet remained, the senior began to chide him severely. Comgall then arose, and prostrating himself on the earth, he began to pour forth copious floods of tears. Being asked, why he wept, the holy man replied, "Because I am grieved, I have not had such an opportunity of practising humility, for many years past". One day, Comgall, with his own hands, was engaged in making a wooden coffin, in which the brethren were to be placed, when death approached. One of the monks, Enan, by name, said, " Father, you do a good work for the brethren, about to repose in this coffin, since it must aid them to obtain salvation; would that I were permitted to depart this life in it." Comgall replied, "Be it so, brother, according to thy wish; as, from this coffin thou shalt depart to Heaven." It so happened, that brother was sent to a place, far distant from Bangor monastery, and while there, he died. However, St. Comgall ordered his body to be conveyed to Bangor ; where, through the prayers of our holy Abbot, the monk was restored to life. The resuscitated brother frequently told his fellow-monks what he had seen and heard, after his first departure from life. " I was," said he, " brought towards Heaven, by two Angels, sent from God ; and, whilst on the way, behold other Angels came to meet us, saying, "Bear this soul to its body, for Comgall, God's servant, hath asked it. Therefore, bear it to Comgall, with whom the monk shall live, unto an old age. He lived, for many subsequent years ; and, at the close of life, his soul ascended to Heaven, while his body reposed in that coffin, made by our saint. It was a custom, in the monastery of our saint, if any one among the brethren should chide another, that person, who had received such reproof—whether deserving it or not—was required to go on his knees. Wherefore, at one time, while Comgall visited an island, in the northern part of Ireland, some monks chanced to be sailing on the middle of a lake. A brother, who was steering their boat, reproved one of his companions. Not regarding the danger in which he was placed, as the boat was small, that brother is said to have leaped from it, that he might prostrate himself. But, at once he sunk under the water, where he remained buried beneath the wave, from the first, to the ninth, hour of the day. Full of sorrow for the accident, which had occurred, the reproving monk told St. Comgall about the matter. Without any show of inquietude Comgall said, " The Lord is able to preserve our brother alive, beneath the water ; return you, and seek him, where he has been submerged." The monks accordingly did so, when one of them, who was an excellent swimmer and diver, plunged into the water, and he found the young monk lying beneath, with his face towards the earth. The diver bore him to the surface, alive and well. The monk then said to his companions, " I suffered no more inconvenience under water, than if I had been on dry land." This miracle confirmed in that practice the brethren, who bore further reproaches with humility. The Miracle of "The Obedient"
There was another young monk, in St. Comgall's monastery; he was so distinguished for humility, mildness, and obedience, that he did whatever was required, and avoided whatever had been prohibited. Commands were executed in so prompt a manner, by this monk, that his brethren gave him the title of "The obedient." One day, while Comgall was on a journey, accompanied by this young man, and with other companions ; all these came to a spot, where a great inundation had taken place. Having received a reproof from one of his brethren, that young monk immediately fell upon his face, near the sea-shore; and, as he remained among the last arrivals, his action was not observed by the company. The brother, who was much attached to the Abbot, bore his shoes ; and, when our saint came to a dry part of the shore, he asked for " The obedient." Not being seen among the other monks, his Abbot enquired, if any of the brethren had reproved him. One of them confessed that he had. Comgall ordered the monks to return, and to seek him. While doing so, the rising sea-tide had covered the whole shore, the brother yet remaining prostrate, although within a very short distance from the elevated banks. On raising that obedient religious, his brethren brought him to St. Comgall. Then, the whole company returned thanks to God. Being in some necessity, the Abbot one day required a monk to cross over the strait of the sea, in a direct course. This brother, we are told, passed over with dry feet, and returned safely to the saint. At another time, he required one of the monks, to go into the workshop of a smith, who was absent, and to make a frame, on which fishes might be boiled. At the same time, Comgall blessed his hands. That brother, hitherto unskilled in the smith's art, made the article as required, together with many other useful things, on the same day. When, too, in a spirit of obedience, one of his monks bore a hot stone from the fire to St. Comgall, his hands were preserved from being burned, for which singular favour he returned thanks to God. A certain boy, learning to write, made no progress in this art, for several days ; when, coming to St. Comgall, he received a blessing on his eyes and hands. This tended to perfect him in penmanship, so that in a short time, he excelled all others, and became a celebrated professor of writing himself. Some thieves were in the habit of stealing vegetables and fruit, raised by the monks, who laboured with their hands, while praying with great fervour. The monks complained to their Abbot, that the brethren and their guests were thus deprived of the produce procured by their labours. On the following night, Comgall made a sign of the cross over his garden. At the same time, he said, "O Omnipotent God, who art able to do all things, deprive of their sight those thieves, who enter here, that they may wander about inside of this garden, until induced to confess their guilt." Accordingly, on that night, when those robbers entered the enclosure, they became blind; and, they wandered about the garden, in ignorance of a place, where they might find an exit. At last, moved to penitence for their crime, they called for help, and then brought their ill-acquired store to the monks. The robbers made a public reparation for their crimes. Afterwards, becoming true penitents, and assuming the monastic habit, they embraced St. Comgall's rule.